Ovi Inlands report from Bobby ... huge thanks again to Harken, Ovingtons as well as Grafham for their support. Not forgetting Charlie Stowe for the effort he put in organising and re-organising the event and being CSL on "Big" Saturday. The 29er Class is a signatory to the RYA Racing Charter. Details of that charter and the relevance to 29er Class members can be found below and in the documents section of the website. Well done to all the competitors this weekend during two days of racing that tested the upper and lower end of the wind range. Huge thanks also to Grafham for hosting the rearranged dates. Congratulations to Crispin Beaumont and Tom Darling winners of the Europcup event at Lake Garda from the Slovenian pair that finished 4th at the Worlds. James Grummett and Daniel Budden finished 5th overall to leave 2 GBR boats in the top 5. On the 24th of July 55 boats took to the water for the 4th Harken Grand Prix at Weymouth and Portland National Sailing Academy. The breeze was up at 12knts for the first few races and with a keen race officer the fleet launched on time out into the Weymouth Bay. Hayling Island hosted the third GP in the Harken series on the 10/11 of October. It started cold and cloudy, with little wind, quite different to that forecasted, but with the usual Hayling tide. This made it an interesting day of racing with few teams being very consistent. Crispin and Tommy lead the first day with Dan and Nathaniel in a close second, counting two 1sts, and Arron and Billy in third. Other race winners included Bella and Ella and Bobby and Harvey. Royal Torbay Yacht Club hosted the 2nd event in the 2015/16 Harken Grand Prix series over the weekend of 26th/27th September. 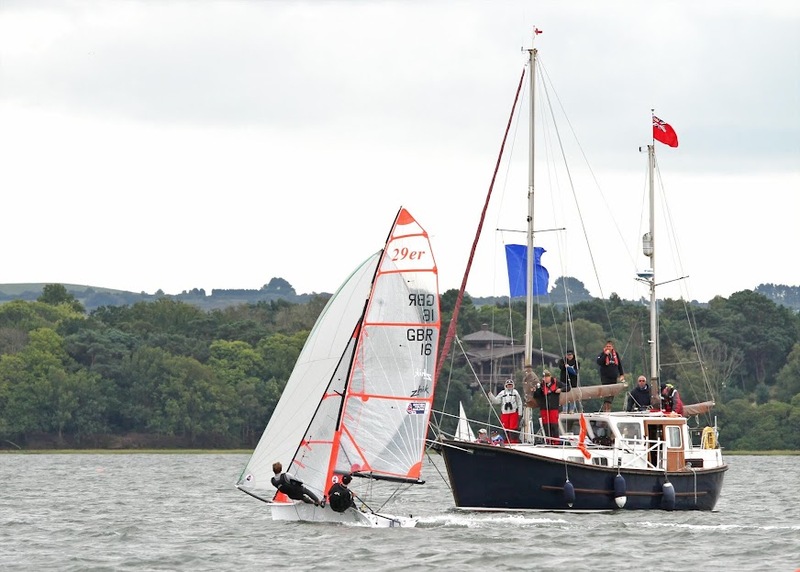 Poole Yacht Club hosted the first GP of the season sponsored by Harken on September 5th and 6th. It was excellent to see lots of new faces around the boat park and 44 boats were entered. The wind was light and shifty to start, which made the sailing interesting. The day started with the wind coming from the North at 4-7 knots and slowly moving east strengthening to 14 knots at the end of the day, with some large shifts and changes in pressure. It was a very difficult day for the race officer because of some of the big shifts coming down the course and he did a good job getting 5 races in. Sunday came and there was no wind the fleet waited and waited and waited and waited but no wind came and the sailing was cancelled. The results from the 2015 Harken Grand Prix series are now available online. Kiel Week 2015 saw ten GBR 29ers competing within the 85 strong fleet from 15 countries. The fleet were split into 3 flights racing a windward leeward course. Despite the light 4 – 8 knot winds on day one the RO managed to complete 4 races. Germans dominated with light weights Paul Pietzcker / Linus V. Oppen (scored 1/1/1/4) ahead Gwendal Lamay / Luke Willim (5/9/2/1) in 2nd; & 3rd Hinnerk Siemsen / Sören Brandt (8/6/2/1). Top Brits were Dan Venables / Patrick Keech (5/10/1/4) in 6th. If you have posted an item in the forum that is older than 45 days then they will be removed from view. This is an automatic policy that will be turned on shortly.